Over 20 million adults over the age of 20 have chronic kidney disease. In 2001, 392,023 U.S. residents were under treatment for End Stage Renal Disease (ESRD). Each year, kidney disease kills more than 14 people out of every 100,000, making it America’s ninth leading cause of death. Medicare spends about $14 billion dollars annually to support and treat ESRD. (The preceding, courtesy of the American Society of Nephrology) Several hundred thousand Americans undergo dialysis treatments each year and over 100,000 have a kidney transplant. However, treatment for renal failure carries its own risks and patients must educate themselves to these risks in order to protect themselves and help to minimize them. Each year, people die or are injured unnecessarily due to negligence or medical errors committed during their treatment for kidney disease. There are thousands of incidents of dialysis errors or dialysis malpractice each year. In fact, in November 2003, the General Accounting Office (GAO), Congress’s watchdog agency, found that a substantial percentage of dialysis facilities do not meet the government’s standards for quality of care. In 2000, Medicare determined that 512 dialysis facilities in the U.S. had 20 percent or more of their patients receiving inadequate dialysis treatments, and nearly 1,700 facilities had 20 percent or more of their patients receiving inadequate care for anemia. 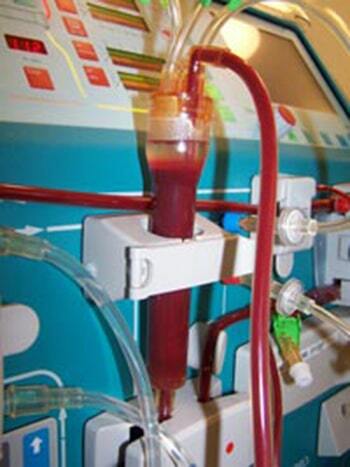 Negligent dialysis involves medication errors, patient falls, vascular access-related events, dialyzer errors, excess blood loss and prolonged bleeding, dialysis machine leaks, malfunctioning machine alarms, improper responses to machine alarms, failing to clear dialysis machines of cleaning solutions, negligent cleaning and filtering of water system at the dialysis clinic, dialysate error (improper use of acid concentrate – the acid part of a two part bicarbonate concentration system – in hemodialysis machine), failing to monitor blood pressure and other vital signs and causing bloodstream infections because of contamination of lines or machinery in addition to other negligence. Most of the dialysis treatment facilities around the country are actually owned by a few very large healthcare companies. For example, most of the outpatient dialysis facilities in the United States are owned by two very large companies; Fresenius Medical Care and DaVita Healthcare Partners, Inc.
Fresenius Medical Care is probably the largest company operating dialysis clinics in the US. Fresenius owns or operates 3,335 dialysis clinics around the world. It posted net revenues of over $14 billion in 2013. DaVita Kidney Care is a division of DaVita Healthcare Partners Inc., a Fortune 500 company. As of mid Summer 2014, Davita owns, operates or manages over 2000 outpatient dialysis centers throughout the United States. They also operated 84 outpatient dialysis centers in 10 countries outside of the United States and have over 46,000 employees. If you are a person on dialysis, it is important to educate yourself to the practices and procedures followed at your clinic in order to secure good and safe treatment. In the event, that you did not receive proper treatment and sustained a serious injury, you should consult with an experienced dialysis malpractice attorney. If you or a loved one has been injured by negligent dialysis or dialysis malpractice and you would like to speak with our experienced Miami Kidney Dialysis Errors Attorneys, please contact Boyers Law Group at 800.545.9100 for a free consultation about your legal rights.